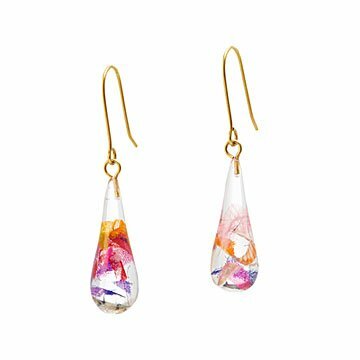 Colombian artisans preserve colorful little swatches of upcycled floral saris inside eco-resin teardrops. Pretty scraps of floral sari fabric seem to float inside these one-of-a-kind earring pairs designed by Tulianna and Alejandra Garces. Each colorful teardrop is crafted from sustainable, vegetable-derived resin, a completely renewable alternative to synthetic, petroleum-based materials. Stylish with a story, the snips of bright, woven fabric pop with color when they catch the light. Handmade in Colombia. 1.5" L x .5 W Full Drop: 2.5"